The next generation of wireless communications technology will use visible light instead of radio waves, with data piggybacking on interior lighting systems which researchers say will offer both greater speed and better security than today’s radio networks. Boston University’s College of Engineering (BU) is developing the “smart lighting” system using low-power light emitting diodes (LEDs) that can be switched on and off so rapidly that the change is imperceptible to the human eye. 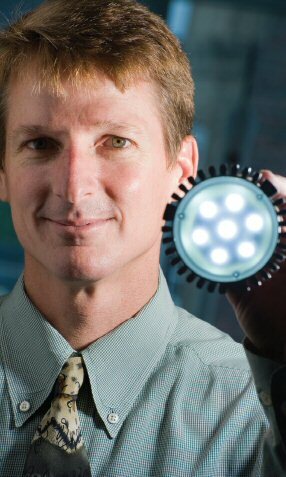 Professor Little is part of the Smart Lighting Engineering Research Center, an $18.5 million, multi-year National Science Foundation program awarded to Boston University, Rensselaer Polytechnic Institute and the University of New Mexico (UNM) to develop the optical communication technology that would make an LED light the equivalent of a WiFi access point. Rensselaer and UNM will work on creating novel devices along with systems applications to better understand the proliferation of smart lighting technologies plus materials needed for wireless devices to interface with the network. Boston University researchers will focus on developing computer networking applications, specifically the solid state optical technology that will form the network’s backbone. Professor Little envisions indoor optical wireless communications systems that use white LED lighting within a room – akin to the television remote control device – to provide Internet connections to computers, personal digital assistants, television and radio reception, telephone connections and thermostat temperature control. With widespread LED lighting, a vast network of light-based communication becomes easily achievable. A wireless device within sight of an enabled LED could send and receive data though the air – initially at speeds in the 1 to 10 megabit per second range – with each LED serving as an access point to the network. Such a network would have the potential to offer users greater bandwidth than current radio technology. Moreover, since this white light does not penetrate opaque surfaces such as walls, there is a higher level of security, as eavesdropping is not possible. LED lights also consume far less energy than radio technology, offering the opportunity to build a communication network without added energy costs and reducing carbon emissions over the long term.